Walk, run, bike and play in the streets this Sunday, August 19 at Open Streets TO! Open Streets programs, also known as Ciclovias, open streets to people and close them to cars to encourage participation in physical activity and healthy recreation, as well as to give communities the opportunity to experience their city in a whole new way. There are no finish lines, parades or sidewalk sales, but there are exercise classes, art installations, musical performances, street games and neighbourhood tours. 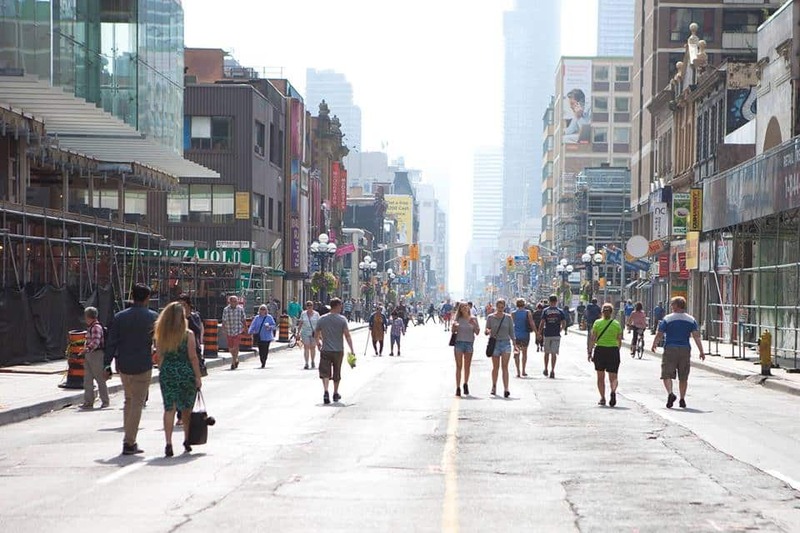 This year’s festival runs from 10 a.m. to 2 p.m. on Bloor Street between Grace/Christie Streets and on Sherbourne and Yonge Streets from Bloor to Queen Street. Along the route, you’ll find interactive games about hunger and food waste, an Azerbaijani dance workshop, yoga, bike tune-up stations, mural painting workshop, aerobics classes, sidewalk chalk stations, a pop-up park, and lots more. Four-legged friends are also invited to take part in the group dog walk beginning at Bloor and Sherbourne Streets at noon.